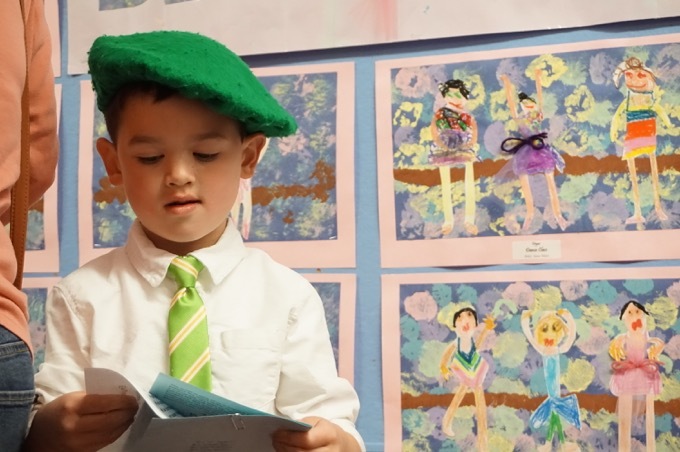 The Impossible Dream… We did it. 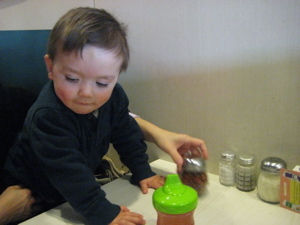 We successfully took a two-year old to Pepe’s Pizza on a Saturday. In a sense, when all is said and done with CTMQ, this may go down as the greatest feat of all. 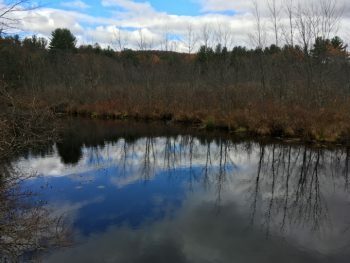 Even if we reach the highest point in all 50 states and do go to every single museum in CT and hike every inch of every blue trail. 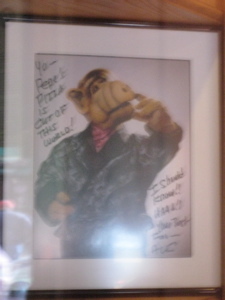 Those of you familiar with Pepe’s know why – those who aren’t, I am not exaggerating. 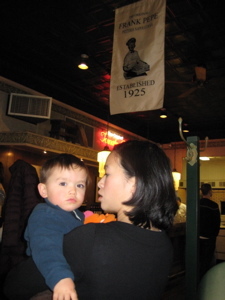 New Haven is home to some great restaurants – both historically and gastronomically; Louis’ Lunch, home to America’s first hamburger, being one such place. People like to wait in line over there, sure, but not like they do on Wooster Street. Wooster Street, a few blocks for the Yale campus is home to New Haven’s Little Italy. There are a few pizza joints and other assorted Italian bakeries and coffee shops. Locals will debate on and on about which restaurant serves the best pie – Modern, Sally’s, or Pepe’s, but there is no debate about which one has the most cachÃ©: Pepe’s. Hoang and I had taken Damian shopping at IKEA in the morning, in an effort to find him some cheap Swedish furniture that we won’t care about when he destroys it. Contrary to normal IKEA trips, this one went quickly and smoothly so I decided to tempt fate: “Let’s go to Pepe’s for lunch.” It was about 11:40 AM so I figured we’d be okay. Plus, it was a beautiful day anyway and Damian seemed content. We parked and there was no line! Outside. The little vestibule was packed with people waiting but we decided to stick it out outside as long as Damian allowed. There is no such thing as a waiting list at Pepe’s. You just sort of wait and police yourselves. Cutters would probably be knifed and the infirm do seem to get preferential treatment, at least on cold winter days. Once the line moved us into the warm vestibule, the seating strategy takes on a different tact. A guy comes out and asks “Who’s next” and gathers the party numbers of the next few groups. Groups whisper and make deals, friendships are forged and two parties of two quickly become one party of four. That’s how it works at Pepe’s. Just as Damian was getting a little fussy, we were seated in a little pleather booth. Since the menu is so simple (and being just a sign on the wall), the waitress hardly gave us any time to decide and took our order: One small “mootz” and one small clam. 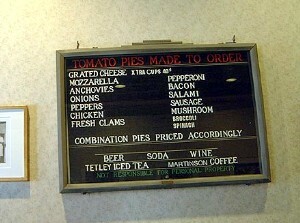 That would be just a cheese pie and a white clam pie. Clam?! Oh you poor, poor souls ignorant to the ways of New Haven style pizza. 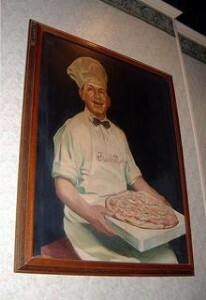 The origins of the clam pie are said to be that Frank Pepe himself came up with the idea as a lark. 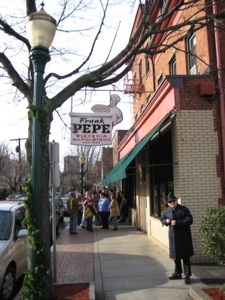 The local fishermen in New Haven always had bushels of clams on hand, and Mr. Pepe had the idea of putting them on pizza. After baking one up, he was surprised it worked and hence the clam pie was born. I happen to love it – the clams are fresh and not rubbery and not “clammy” at all. A little olive oil, garlic, oregano, and a dash of grated Parmesan – perfect. Don’t believe me? 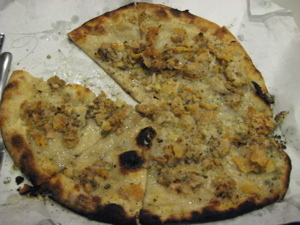 Michael Stern from Roadfood says the Pepe’s clam pie would be his last wish meal. My one complaint? Your Diet Coke comes in 6 ounce glasses. What’s that all about? 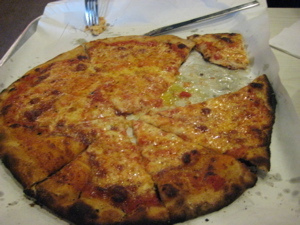 The crust is what makes NY/CT-style fantastic, in my opinion. Thin, slightly charred, the perfect chewiness… And Pepe’s does it right in their massive coal fired ovens. I can’t really eat pizza with thicker crust anymore and as far as that monstrosity known as Chicago deep dish, well, that’s not even pizza. That’s glop on a plate. And don’t get me started on the pineapples on pizza thing. 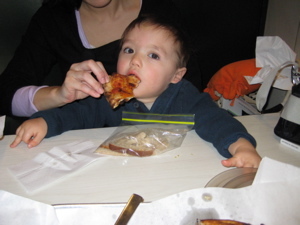 Damian was great throughout, chowing down on the plain pizza with reckless abandon – high praise indeed. Between the three of us, we almost polished off both small pizzas before leaving to buy a couple cannoli at the world’s slowest Italian bakery down the street. By the time we left, the infamous line was a block long (about two hours) but orderly as usual. I would never wait in that line – it’s just pizza after all – and the fact that this scene plays out all day and night every day and night is just crazy to me. Crazy I says. Alton Brown had a special on the countries best, as in best pie, best pizza, best bbq. Pepe’s wasn’t even in his top 3. I hated him for about a week but honestly, how can I stay mad at him? my favorite TV use of Pepe’s was when Gene Siskel got to interview Meryl Streep so they did it in Pepe’s. Apparently she went to Yale. Seemed kind of odd to be honest. The Clam pizza really does live up to the hype. They shuck fresh clams for every one so it’s super fresh. And the mix of olive oil and lots of garlic. Its out of these world. Although the winter clam pizzas are not as good. I think the clams are just out of season and smaller or something. I took my GF at the beginning of our courtship to Pepe’s. I had raved about it for the longest time. Growing up my dad would go to meetings in NY and on the way back would always pick up a few pies, so I grew up on it more them most people in Hartford did I suppose. Since she’s a vegetarian and doesn’t like shellfish we couldn’t get the famous clam so instead we got a veggie pizza. It honestly wasn’t fabulous. Good mind you, but after I had raved and we had waited in line for so long, I had to explain to her that it really is better than this. Why wait hours for a pizza when Dominoes delivers in 20 minutes? Not that I have ever had either – but just asking? Hey just get a booth at Pepe’s and have Dominoes delivery to you there. How do you suppose that would go? I have been to both Pepe’s and Modern. Yay me! I have waited for hours also. After a UCONN-Yale football game was the longest…that took a 6-pack. But there is no question that “The Spot” is on a pizza platter all it’s own. My kids were taught to say (and believe) “Pepe’s brick oven pizza rules!” with enthusiasm. And for my money, it’s the white pie with clams, bacon and garlic. And of course something hoppy to wash it down. My father who grew up in New Haven always was partial to Modern.